Bold indicates projected regional team, Top 25 ranking in parentheses, and records are from 2014. Teams are listed in order of projected finish. To view our Top Prospects lists for the 2015 and ’16 draft classes, as well as our Impact Freshmen, sign up for a D1Baseball.com subscription. • Dartmouth head coach Bob Whalen said last year’s team was a year early in its accomplishments. So look for another run for the Ivy League crown. Nearly all of the pitching comes back, led by Duncan Robinson (7-3, 2.96, .210 OBA), one of the league’s top prospects thanks to the downward plane on a fastball that reaches the low 90s and his putaway slider. The Concato brothers, Sr. RHP Louis (1-2, 3.60) and So. RHP Mike (2-3, 3.81), join Robinson in the rotation, and both offer advanced feel for pitching. Sr. RHP Thomas Olson, who missed last year with a nerve issue, could anchor the bullpen if he is healthy—and he has been effective when he has been on the mound, with a 1.53 career ERA in 53 IP. Four of the five infielders that led the Big Green to a top-flight .979 fielding percentage are back and all of them are seniors, led by SS Matt Parisi (.273/.348/.353). But Dartmouth caught a tough break when senior 2B Thomas Roulis (.300) went down with an injury that will cause him to miss the season. Look for OF Bo Patterson (.295/.329/.321) to make a bigger impact as the season goes on, after missing fall practices due to his wide receiver duties on the football team. OF Kyle Holbrook showed off a quick bat and good instincts in the fall, and he should contend for Ivy league freshman of the year honors. • Columbia has had a mercurial run of late in the Ivy League wars, winning back-to-back titles and advancing to the Big Dance. But is that run over now? Losing ace David Speer and Joey Donino will be tough to overcome. RHPs George Thanopoulos (5-2, 2.60, 3 saves) and Kevin Roy (6-5, 3.06) will carry a heavy load in the top two spots in the rotation. Thanopoulos has the best stuff on the team, with an 88-92 fastball with good run and a quality slider. The rest of the pitching staff is unproven, but at least the offense and defense should be good with seven returning starters, including the top six hitters from a year ago. Look for 2B Will Savage (.320, 14 SB), OF Jordan Serena (.305, 25 SB) and OF Gus Craig (.277-6-26) to keep the wheels turning. Not only is Serena a plus runner, he is also a smart, efficient basestealer who has swiped 57 bags in 66 tries in his career (86 percent success rate). Also, if former Iraqi and Afghanistan veteran Joey Falcone can revert back to his freshman form, when he hit .335-5-29, the Lions’ roar gets even louder. 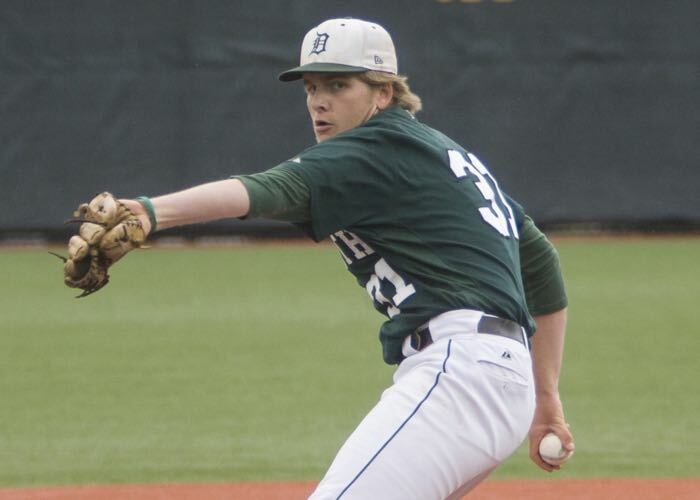 • Like Dartmouth above, the Pennsylvania Quakers will have nearly their entire pitching corps back again, including a pair of starting studs in RHP Connor Cuff (5-3, 1.77) and LHP Ronnie Glenn (5-2, 3.46). The competitive Cuff works in the 87-91 range, but his bread and butter are his offspeed pitches—two breaking balls anc a changeup. The physical Glenn can bump 92 from the left side and has a solid slider. Also, the coaches raved over the improvement of LHP Mike Reitcheck (0-2, 4.22, 5 saves), who will move from the ‘pen to a spot in the rotation. And tall, projectable RHP Jake Cousins (4-0, 1.59) could push for a rotation spot if he can continue to develop his curveball to complement an 88-91 fastball with good downward plane. The Quakers could also have more electricity in their bats than anyone in the Ancient Eight with 1B Jeff McGarry (.316-4-30), C Austin Bossart (.297-4-19) and SS Ryan Mincher (.271-4-24). Bossart, the team’s best prospect, is the Ivy’s best defensive backstop and brings some pop to the gaps, while McGarry can hit for both average and power in the heart of the order. Freshman 2B Ryan Schroth also should make a big impact with his plus-plus speed (6.5-second 60-yard dash) and gap-to-gap approach. • Once again, we have to question the sanity of the Princeton schedule-maker, as the Tigers will open at LSU, at UNC Greensboro, at Maryland and at East Carolina. They’ll forge on without their three best players in leading hitter Alec Keller, staff horse Michael Fagan and ace reliever Johnathan York. But everywhere else, it’s all hands on deck. Sophomore pitchers Chad Powers (3-4, 4.91) and Keelan Smithers (2-4, 6.17) return to their starting roles, and they’ll pitch to an accomplished backstop in catcher Tyler Servais. RHP Cameron Mingo, who was limited to six starts a year ago, is back in the Friday starter role, and he rates among the league’s top prospects thanks to his pitchability and the projectability left in his 6-foot-4, 180-pound frame. OF Danny Baer (.306) is the only returnee with a .300-plus average. He and Paul Tupper bring plus speed to the outfield and the basepaths. The Tigers should be outstanding up the middle, as Servais and Baer are joined by two senior middle infielders—2B Daniel Hoy (.285/.381/.417) and SS Billy Arendt. Hoy is a gamer with smooth defensive actions and a knack for making hard contact; he led the team with three homers and nine doubles last year. • Yale has the dubious distinction of getting the second-latest start to the season in D1, not throwing out the first pitch until March 7 at the Davidson Tournament. Only Central Connecticut State’s March 11 opener is later. The Bulldogs will have one of the best batteries in the league with RHP Chris Lanham (7-2, 3.77) and C Robert Baldwin (.304-3-24). Lanham complements his high-80s fastball with an emerging curveball and changeup. Also, talents like RHP Chris Moates (1-2, 2.11, 3 saves), RHP Chasen Ford (3-4, 5.37) and freshman All American Richard Slenker (.352) could make the 150th season in school history a memorable one. Ford is the pick to click: He was a big-name recruit out of high school in Southern California, and he can touch the low 90s and flash a promising curveball. • Cornell has solid pitching back, including the deepest bullpen in the league. The Big Red is also relieved to get the services of RHP Brian McAfee back again, after he was 9-2 in his first two years, but sat out all but two games of last year due to a stress fracture in his back. He will take back the Friday role and will join 2014 staff ace Michael Byrne (3-4, 1.86), a tenacious high-80s lefty who held opposing batters to a .205 average. Powerstick Ryan Karl (.280/.356/.552, 9 HR, 32 RBI) will team with burner J.D. Whetsel (.265, 15 SB) to provide bash and dash. • Oy vey! Harvard hasn’t had a winning season in Ivy League play since 2007’s 12-8 mark. The good news is that the Crimson had the fourth-best pitching staff in the Ancient Eight, posting a 4.19 team ERA, and some key arms are back this year. RHPs Sean Poppen (2-4, 2.51, 8.1 strikeouts per game) , Nick Gruener (1-4, 3.88), Matt Timoney (3-5, 4.76) and Tanner Anderson (1-2, 3.21) give them a shot. Poppen, one of the league’s top prospects, is a fast-working bulldog with a solid-average fastball, a clean delivery and the ability to keep hitters off balance by throwing his slider for a strike or a chase pitch. He is also developing a changeup with some sink. • For the first time since 2011, Brown had a double-digit win total in a season, finishing with 13 wins a year ago and making a midseason coaching change. Assistant Grant Achilles was named full-time head coach after the season concluded in June; he played at Wake Forest from 2002-06 and brings youthful energy to the leadership of a program that was founded during the Civil War (1863). Can things get even better in 2015? Well the top two pitchers are back in RHPs Christian Taugner (2-4, 2.39) and Dave St. Lawrence (1-6, 5.44), who also had five complete games. Offensively, most of the top hitters have moved on, so hopes to better that .254 team average don’t look good. But the Bears do have a pair of two-way players who are capable of putting up numbers in OF/LHP Will Marchal (who brings intriguing lefthanded power potential) and RHP/OF Kevin Guthrie (son of former big leaguer Mark Guthrie). Also expect a step forward from sophomore OF Robert Henry (.245/.318/.288), who offers athleticism and arm strength from the outfield..